Kom has been alternately referred to as a “Kingdom of Mountains” or “Kingdom of Mentors.” In some respect this is true. Surface Area: 15,000 km or 6,100 mile. Religions: Animism, Christianity, and some Islam. Economy: Cash crops - coffee, kola-nuts. Subsistence: corn, pumpkins, yams, beans, potato, groundnuts, vegetables, etc. The King or Fon’s position is hereditary within a localized patrilineal lineage. Descent, succession and inheritance are matrilineal. Polygyny is practiced though becoming obsolete. Marriages often required a substantial bride price. Men clear the fields, build houses while women do cultivating. Kom are enterprising. Kom is a male dominated society. Everything revolves around the man, and the woman’s role is in the kitchen and farm. Man power measures is the number of wives. Polygamy is a thing of pride. Culture rotates around respect for the elders. Located in Boyo Division,Northwest Province of Cameroon. It is a mountainous and rural area. 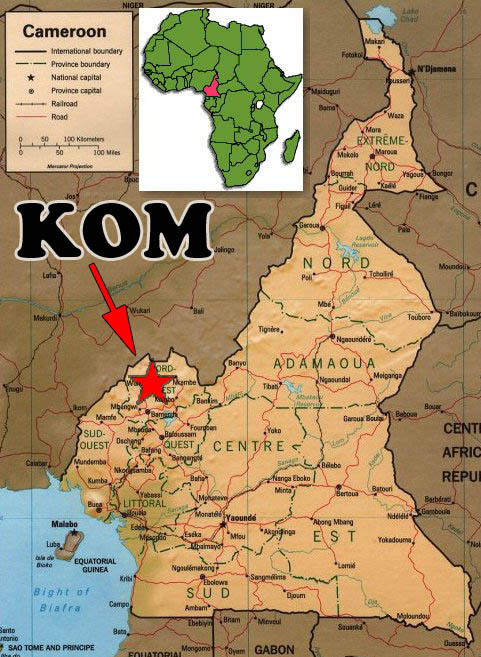 The Kom people live in major valleys. Belo is the largest valley according to population figures approximately 50,000. Njinikom and Fundong or Abassakom areas are the other valleys. Kom people first settle in Liakom before expanding southward driven by the need for more farm land. The Kom tribe is one of the principal ethnic groups of Cameroon whose people traditionally speak Itanghi-Kom, meaning, “Kom language." Itanghi-Kom is a non-written language though aggressive efforts have been implemented in recent years to codify the language. Located in the Cameroon’s western grasslands of the North West Region, the tiny enclave consists of approximately 150,000 inhabitants and covers an area of over 300 square miles. Kom topography is mountainous and traveling from one district to another is only possible by crossing fast flowing rivers and steep slopes. The fascinating landscapes, inspiring green mountain ranges, beautiful hillside farming beds, incredible spiral patterns and flatlands that stretch throughout the area are breathtaking. Cameroon is remarkably heterogeneous and multilingual with distinct languages, culture and norms that have set them apart as a people. There are over 200 ethnic groups in Cameroon. Dr. Eugene Zintgraff was the first European to reach Kom in 1889. 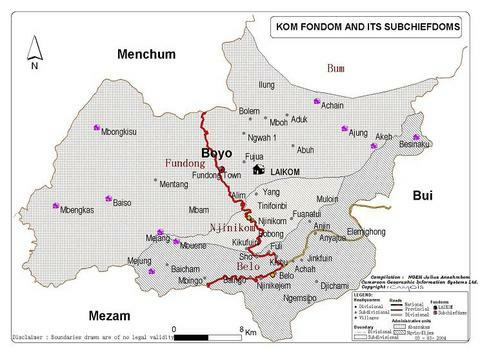 Kom is traditionally divided into 43 villages. The villages make up the kingdom and compounds or homesteads make up the villages. The villages are grouped into traditional councils for administrative purposes with each village governed by a village Head appointed by the Fon. 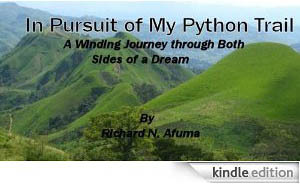 The origin of Kom is not known but according to oral tradition, Kom people came to settle in their present day location after being led by a track of a python. Legends hold that the Koms migrated to Bamesssi and lived peacefully with Bamessi people until the Kom began to prosper and outnumber the locals. Then the local chief of Bamessi proposed with Kom Chief a plan to build two houses to be used in killing older male population to eliminate the rapidly growing male population. The plan was agreed upon and one house was designated for Kom people and the other for Bamessi. Unknown to the Kom leader, the Bamessi house contained a secret escape tunnel but there was no such tunnel in the Kom people's house. Both houses were ordered burnt killing the majority of Kom male population but the Bamessi people escaped through the underground tunnel. This was an act of trickery orchestrated by the Bamessi chief due to jealousy though some Kom people were accused of complicity in the act and castigated as “traitors. A mysterious lake rich and plentiful with fish was formed from where the Kom leader had hanged himself. The Bamessi people saw this lake as bountiful source of food and entered the lake in great numbers. The bottom of the lake collapsed killing the majority of Bamessi people, therefore, fulfilling the deceased leader’s prophecy. It is possible that the Python trial may one day reappear? This subject has been intensely debated by the Kingdom’s elites and intellectuals. The overwhelming consensus is that the python track will one day reappear and that we must constantly watch for it. In fact, sinisters have been asked to be on alert and mobilize when that day comes.